This tutorial demonstrates the usage of HierarchicalDataTemplate and Style Bindings in RadTreeView. For more information about HierarchicalDataTemplate take a look at the HierarchicalDataTemplates topic. As you can see, an Organization has a Name and a list of Departments. A Department also has a Name, as well as a list of people that work in that Department. A Person has a Name. 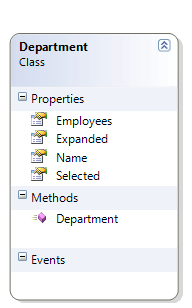 There are two more properties - Selected and Expanded. They will be explained further in the article, but in short, they will be used to control whether a certain RadTreeViewItem is expanded or selected. Now it is time to define how each level of the RadTreeView will look like. 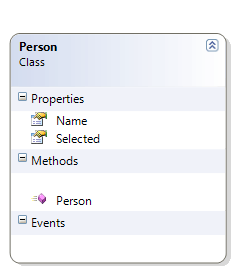 You should use HierarchicalDataTemplate. 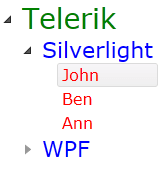 But what if you want to expand only the "Silverlight" node and to select the "John" node, leaving the WPF node collapsed. This is where the Style Binding comes in hand. Define a new style with RadTreeViewItem for target type. Find your treeview declaration and set the ItemContainerStyle property. As you can see, the IsSelected property of each RadTreeViewItem is bound to the Selected property in the data source. The same is with the IsExpanded property. That's why now you have to update your data source. 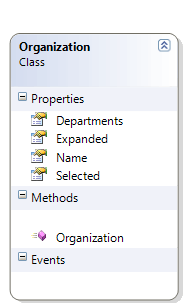 If you want to implement two way data binding, your business objects should implement the INotifyPropertyChanged interface. Additionally, you should set the Binding's Mode to TwoWay in the Style declaration.